Go underground on a 1-hour walking history tour through Seattle's original neighborhood, Pioneer Square. Join a guide and small group below street level to see Seattle as it existed in the 1890s. Explore underground pathways that were built more than 120 years ago, learning details on early Seattle history, why these spaces were built, and how they have been used (and misused) over the years. Marvel at how this once Indian encampment has since transformed into one of the 20 largest cities in the United States. Your tour begins at 102 Cherry Street, just off 1st Avenue in Pioneer Square. 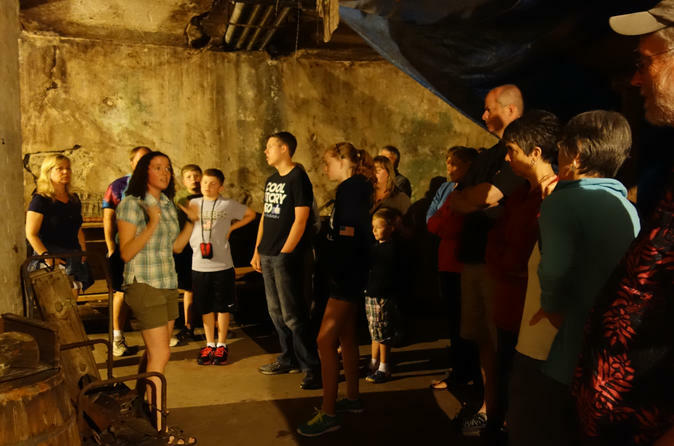 Here, you'll greet your guide before delving into the depths of underground Seattle and and its history during a subterranean walk through the city’s original neighborhood, Pioneer Square. Your guide regales you with stories of Seattle’s past, from its role in the Klondike Gold Rush to the notorious Skid Row, once Pioneer Square’s main hub. Wander among darkened passageways, occasionally popping up to street level, as you traverse approximately three blocks and cover more than a century of history. Be sure to wear comfortable walking shoes: this 1-hour tour includes six flights of single-story stairs as well as a variety of surfaces, many of them uneven. Your tour concludes at Occidental Park, around 3 blocks from the start point.